More than 50% of bipolar disorder (BD) patients have onset before age 20. Children with attention-deficit hyperactivity disorder (ADHD) may develop BD when they grow into adolescents. This study was designed to investigate early distinct regional cerebral blood flow (rCBF) in the presence of atypical bipolar symptoms in adolescents with ADHD. The study included 14 adolescents with ADHD comorbid BD (ADHD-BD) and 25 adolescents with ADHD only who were recruited at a university hospital. They were evaluated with the Kiddie-Schedule for Affective Disorders and Schizophrenia-Epidemiology version (K-SADS-E) by a child psychiatrist. Each subject underwent brain examinations using single photon emission computerized tomography (SPECT). Between-group differences in rCBF were analyzed with statistical parametric mapping. The ADHD-BD group had more severe symptoms of ADHD, more impulsiveness, more anxiety, poorer quality of life, and poorer adjustment; SPECT showed reduced rCBF in the right dorso-lateral prefrontal lobe, ventromedial prefrontal cortex, and hypothalamus compared to patients in the ADHD only group. The ADHD-BD group had increased rCBF in the left ventro-medial prefrontal cortex, right superior frontal lobe, left superior frontal lobe, premotor cortex, and supplementary motor area. The abnormal rCBF might be involved in the pathophysiology of the development of BD in adolescents with ADHD. Bipolar disorder is present in 16% to 48% of the adolescents with ADHD [1-4]. There is a higher incidence in boys than in girls [5,6]. These adolescents with ADHD show atypical bipolar symptoms including more irritability, explosive behavior, and impaired executive functions, all of which may have a greater impact on daily life in terms of lower academic achievement and more substance abuse, criminality, and unemployment [7,8]. The early identification of BD in adolescents with ADHD is therefore critical for successful intervention . Although the relationship between ADHD and co-existing BD remains unclear, several lines of evidence have suggested the possibility of a specific biological basis . Regional cerebral blood flow (rCBF) in children with ADHD has been studied by single photon emission computerized tomography (SPECT), which has been demonstrated to be a reliable tool for detecting brain abnormalities in childhood neuropsychiatric disorders [11,12]. The radio ligand is bound to hemoglobin for the direct observation of brain perfusion. Through SPECT, hypoperfusion has been detected in the prefrontal lobes of children with ADHD . Hypoperfusion of the frontal lobe has not been a consistent finding in all patients with ADHD, however, and it has been influenced by comorbidity with other neuropsychiatric disorders such as oppositional defiant disorder, conduct disorder , and problems with motor coordination . Previous studies have pointed out that the wide overlap in clinical symptoms in ADHD and BD could create an artificial comorbidity if the symptoms were actually expressions of a single underlying process . This possibility may help explain the frequent misdiagnosis of comorbid BD in adolescents with ADHD. A clear physical difference would help in differentiating these entities. For example, a difference in activation in a brain region between adolescents with ADHD and comorbid BD (ADHD-BD) compared to adolescents with BD only. To the best of our knowledge, no previous study has compared the rCBF in adolescents with ADHD-BD to that of adolescents with ADHD only . The present study posits that there is a deficit in prefrontal rCBF which might involve the pathobiology of developing BD among adolescents with ADHD. There were 39 subjects aged 15-20 years (14 adolescents with ADHD comorbid BD I or II or not otherwise specified [NOS] and 25 adolescents with ADHD as the control group) recruited at psychiatric outpatient of Tri- Service General Hospital. They were interviewed with Kiddie-Schedule for Affective Disorders and Schizophrenia-Epidemiology version (K-SADS-E) to confirm the diagnosis by a child psychiatrist . The severity of ADHD was evaluated with the Adult Self-Report Scale (ASRS) [16,17]. The diagnosis of BD-NOS was defined as lacking a distinct period of time of the presence of elated or expansive mood and other manic symptoms that met the criteria for a manic episode, or presented with an abnormal mood and hyper arousal associated with fewer than three manic symptoms. The abnormal mood was not chronic irritability which would have met the diagnostic criteria for severe mood deregulation [4,18]. All patients were free of medications for at least two months before the application of SPECT and the rating scales. The Institutional Review Board of the Tri-Service General Hospital approved the study protocol and the patients as well as their parents provided written informed consent. Patients with a history of neurologic disease, schizophrenia, substance abuse or dependence, and those who used psychotropic drugs within the past six months, and those with an IQ<70 were excluded. All methods were performed in accordance with the relevant guidelines and regulations by including a statement in the methods section to this effect. Impulsivity was evaluated using the Barratt Impulsiveness Scale (BIS) . Symptoms of bipolar disorder were evaluated by the Mood Disorder Questionnaire (MDQ)  and concurrent conditions by Beck’s Anxiety Inventory (BAI), which has been used in adolescents aged ≥ 15 years [21,22], and Beck’s Depression Inventory (BDI) . Quality of life was assessed using the World Health Organization Quality of Life (WHOQOL) questionnaire  and the Chinese Version of the Social Adjustment Inventory for Children and Adolescents (SAICA-C) . Radiotracer Technetium-99m ethyl cysteine dimer (Tc-99m ECD) was prepared from the Neurolite kit (DuPont, Billerica, MA, USA) according to the manufacturer’s instructions. Tc-99m ECD is a stable, lipophilic complex that crosses intact cell membranes and the blood– brain barrier by passive diffusion and represents the rCBF. Approximate 25 mCi of freshly eluted Tc-99m pertechnetate was added to 5 mL saline solution. Subjects were placed in the supine position with their heads immobilized by a head holder before the injection of the radiotracer. After 30 min in a resting state, brain SPECT imaging was performed using a dual-headed camera equipped with ultra-high resolution fanbeam collimators (Hawkeye, Millennium VG, GE, Milwaukee, WI, USA). This system had a 1.6-cm thick crystal and a spatial resolution (center-to-center) of 11.2 mm in full width at half maximum for a point source at 10 cm from the collimator face. Data were acquired in a 128*128 matrix with a 1.4 zoom through 360 degrees (180 degrees for each head rotation) at 3-degree intervals, for 30 s per angle. Images were reconstructed using a back projection method with a Butterworth filter. Attenuation correction was performed using Chang’s firstorder method . The brain SPECT was analyzed from three axial images (transverse, sagittal, and coronal slice views, 0.2 cm slice thickness). Imaging data were analyzed at every voxel (2 mm, 2 mm, 2 mm) using statistical parametric mapping (SPM99). Statistically significant differences between sets of images were assessed at each voxel with a threshold of p<0.001. In order to correct for correlated multiple comparisons, clusters of voxels that exceeded this threshold (k=94.718) were assessed further using the random Gaussian field correction, which calculated the significance of clusters based on their peak height and spatial extent (p<0.05) . This cluster correction method was used to correct for multiple comparisons using voxelbased analysis. A voxel immediately surrounded by other adjacent voxels that is not completely independent of its neighbors was considered to be in the same cluster. Gaussian random field theory was used in this analysis to determine the number of contiguous voxels at an individual, voxel-wise threshold that would be found due to chance alone. If a cluster of a certain size is determined to be exceedingly rare, then it was considered that there is a significant effect in that cluster. The threshold was set at p<0.05. The corrected cluster size (k) was found to be 94.718 in the SPM analysis. Finally, clusters of voxels that passed the statistical threshold were overlaid on template images to indicate the brain regions that exhibited significant changes. The imaging data were analyzed by using software, statistical parametric mapping (SPM). The data were spatially normalized. Brain images from the two groups (BD+ADHD vs. ADHD only) were compared. The level of significance between the two groups was set at p<0.001. Imaging data that passed this threshold for significance of difference after being matched with the Montreal Neurological Institute (MNI) template were considered significant. This method has been used in SPM analysis of brain imaging to find the exact location in the brain which showed a significant difference between two groups . Subjects’ demographics and social/psychological characteristics were summarized as median (IQR: 1st, 3rd quartiles) for continuous data and n (%) for gender by groups. The t-test was used in most cases to compare differences between subjects. Differences between groups were compared using the Mann-Whitney U test for continuous data and Fisher’s exact test for gender; non-parametric tests were used for group comparisons due to small sample size and dispersion of the data. The false discovery rate was used for comparing brain imaging findings between the groups. Statistical analyses were performed using SPSS 18.0 statistical software (SPSS Inc, Chicago, IL, USA). There were 13 males and 1 female in the ADHD-BD group (median age 15; 11 patients aged 15, 1 aged 19, and 1 aged 20) and 21 males and 4 females in the ADHD only group (median age 16; 13 patients aged 16, 10 aged 17, 1 aged 18 and 1 aged 19). There was no between-group difference in gender (χ2=0.63, p=0.64) distribution but there was in age (z=- 3.06, p=0.002). Five patients had comorbid oppositional-defiant disorder (two from the ADHD-BD group and three from the ADHD only group (χ2=0.04, p=1.000). None had other comorbid neuropsychiatric disorders. The ADHD-BD group had more severe symptoms of ADHD (higher ASRS hyperactivity/ impulsivity scores (z= -2.49, p=0.013), more impulsiveness (higher total score on the Barrett’s impulsivity scale (z=-2.82, p=0.005), more anxiety (z=-1.98, p=0.048), poorer quality of life (lower scores in the environmental domain, z=- 2.41, p=0.016 on the WHO-QoL BREF), and poorer adjustment (higher sub-scores for school functioning, z=-2.59, p=0.010; higher sub-scores for peer interaction (z=-2.00, p=0.045), better home relationships (z=-2.24, p=0.025), higher total scores (z=-2.96, p=0.003), and higher global scores (z=-2.67, p=0.008) on the SAICA) compared to the ADHD only group (Table 1). Data are shown as median (IQR: 1st, 3rd quartiles) by groups for continuous data and n (%) for gender. Differences between groups were compared using the Mann-Whitney U test for continuous data and Fisher’s exact test for gender. *indicates a significant difference (p<0.05). Table 1: Comparison of social/psychological characteristics of adolescents with ADHD using a non-parametric method. In the ADHD-BD group, SPECT showed reduced rCBF in the right dorso-lateral prefrontal lobe (Brodmann area 46) (p=0.001), right ventromedial prefrontal cortex (Brodmann area 10) (p=0.004), and right hypothalamus (p=0.003) compared to patients in the ADHD only group. The ADHD-BD group also had increased rCBF in the left ventro-medial prefrontal cortex (Brodmann area 10) (p<0.001), right superior frontal lobe (Brodmann area 8) (p=0.004), left superior frontal lobe (Brodmann area 6) (p=0.001), premotor cortex, and supplementary motor area (Table 2 and Figure 1). 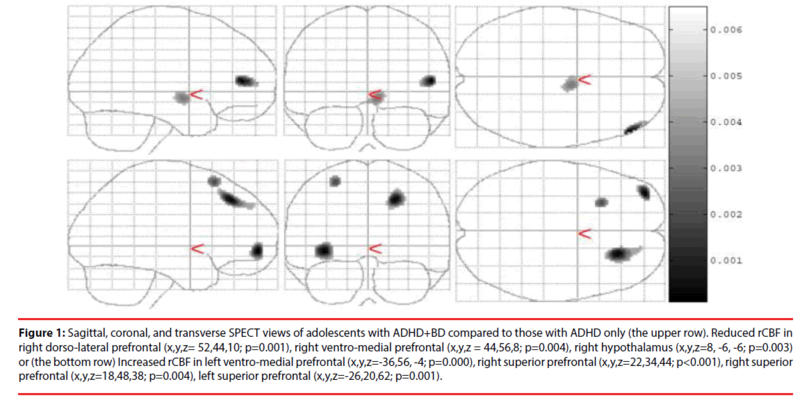 Figure 1: Sagittal, coronal, and transverse SPECT views of adolescents with ADHD+BD compared to those with ADHD only (the upper row). Reduced rCBF in right dorso-lateral prefrontal (x,y,z= 52,44,10; p=0.001), right ventro-medial prefrontal (x,y,z = 44,56,8; p=0.004), right hypothalamus (x,y,z=8, -6, -6; p=0.003) or (the bottom row) Increased rCBF in left ventro-medial prefrontal (x,y,z=-36,56, -4; p=0.000), right superior prefrontal (x,y,z=22,34,44; p<0.001), right superior prefrontal (x,y,z=18,48,38; p=0.004), left superior prefrontal (x,y,z=-26,20,62; p=0.001). Table 2: Brain Regions with Significantly Different Rcbf in the Two Study Groups. The ADHD-BD group had poorer quality of life, poorer social adjustment, and more impulsivity than the ADHD only group. These impairments were independent of depression since the subjects showed no differences in total scores for self-reported depression; however, as in a national survey [27,28] and parental reports on the psychopathology of adolescents with BD [28,29]. we found that this ADHD-BD group had greater anxiety. This suggested a further need for investigation of the role of anxiety in adolescents with mood symptoms. Our previous studies showed that measures of the level of anxiety or depression for reasons other than the diagnosis of anxiety or depression might be the factors which need to be surveyed and controlled to clarify the relationship between ADHD and other associated conditions [21,29,30]. Also, consistent with the findings of a previous study [30,31], our results revealed that hyperactivity was more severe in the ADHD-BD group than in the ADHD only group. Taken together, pediatric patients with more severe symptoms of ADHD may be at a greater risk for developing BD and clinicians should be more aware of this. To the best of our knowledge, this was the first SPECT study of adolescents with ADHDBD, and it showed hypo perfusion in the right dorso-lateral prefrontal lobe in adolescents with ADHD-BD compared to adolescents with ADHD only. The dorso-lateral prefrontal cortex (DLPFC) is connected to the orbito-frontal cortex and is important for learning strategies such as cognitive stability and flexibility in healthy adolescents. It is also associated with affect, social judgment, and executive memory in ADHD [31,32]. The volume of the DLPFC in children with bipolar disorder was reduced [32,33], and reduced grey matter volume of the DLPFC differentiated BD from ADHD [33,34], suggesting that adolescents with ADHD-BD may have more deficits of a top-down control of their emotional disturbances than those with ADHD only. This finding may help in the early identification of presence of BD symptoms in adolescents with ADHD. Consistent with previous studies showing functional aberrations in the amygdala-striatalventro- medial prefrontal cortex (VMPFC) circuit of those with pediatric BD [34,35], the present study revealed that presence of BD in adolescents with ADHD was associated with decreased rCBF in the right VMPFC and increased rCBF in the left VMPFC. In actual clinical practice, patients with pediatric bipolar disorder had more severe ADHD symptoms . As in previous studies [35-39] the abnormal right versus left brain asymmetry was demonstrated by decreased rCBF in the right VMPFC but increased rCBF in the left VMPFC in the patients with ADHD comorbid BD compared to the group with ADHD only, and the current results indicate that the VMPFC may be the pathophysiological site for the presence of BD in adolescents with ADHD. Young people with VMPFC abnormalities were found to have severe antisocial behavior, impulsivity, and hyperactivity [35,36] as well as other behavioral symptoms and disorders. The decrease in activation of the right ventral prefrontal cortex of children with bipolar disorder was related to their impulsivity [36,37]. In addition, abnormal right ventro-medial prefrontal activity was found in adults with BD [37,38], while VMPFC was also related to poor impulse control in ADHD . Some symptoms of ADHD such as psychomotor activation are considered to be the new diagnostic criteria for bipolar disorder [39,40]. Along with the clinical observation of the overlapping of impaired impulse control and motor hyperactivity in both bipolar disorder and ADHD in adolescence [40,41], it can be hypothesized that reduced rCBF in the VMPFC may be the common pathophysiological mechanism in both adolescents with ADHDBD and adolescents with ADHD who display more severe hyperkinetic/impulsive symptoms. Accordingly, longitudinal studies should followup with these adolescents to investigate the possibility of a developing BD among those with severe symptoms of ADHD and reduced rCBF in the VMPFC. In this study, hypo perfusion in the right hypothalamus and hyper perfusion in the premotor cortex, supplementary motor area, and bilateral superior prefrontal lobes was noted in adolescents with ADHD-BD. This was consistent with previous studies showing that hypothalamic-pituitary-adrenal axis dysfunction was involved in pediatric BD [41,42]. These findings suggested that adolescents with ADHD comorbid bipolar symptoms (compared to adolescents with ADHD only) may have more neuro-endocrine, motor control, and emotion processing problems that require appropriate treatment. Other studies, however, have shown normal pituitary gland volume in bipolar adolescents [42,43] and the children of bipolar patients [43,44]. It is difficult to make any definitive conclusions since the hypothalamus is a small region and cannot be easily detected in imaging studies. Additional studies are needed. In addition, the hyper perfusion in the premotor cortex and supplementary motor area in the ADHD-BD group might indicate abnormal motor planning or initiation of voluntary movements since the patients with BD usually showed increased goal-directed behaviors [44-46]. Meanwhile, the patients with BD usually showed poor inhibition ability and preservative behavior which suggests that our finding of hyper perfusion in the superior prefrontal lobe might be involved . Other studies have found that the cerebellum plays a role in mood deregulation in BD. For example, a smaller cerebellum was found in patients with BD [47-49]; fMRI showed abnormal cerebellar activity in the neural circuits which regulate emotion during a gambling test with adolescents with BD [49,50]; stimulation of prefrontal-thalamic-cerebellar circuits might benefit the sleep quality of patients with BD [50,51]; and lithium treatment might improve abnormal activity in the cerebellum of patients with BD [51,52]. In our study, no cerebellar activity in BD or ADHD was observed. There were several limitations to this study. The number of patients was small and this might have influenced the statistical results. Possible confounders such as age, gender, anxiety, subtypes of ADHD, and social adjustment were not included in the analysis and this may have influenced the statistical results. There was a significant difference in age between the two groups. However, adolescents aged 15-17 years might have similar mental development and intelligence. Patients with BD only and normal controls were not included; therefore, it cannot be concluded that the brain imaging specifically identified neural activation in adolescents with ADHD-BD. The results of our study might not be generalized to other types of BD, since the included subjects consisted mainly those with comorbid BD of the NOS type which is different from BD type I or II and the chronic irritability seen in disruptive mood deregulation disorder although a common feature of all is emotional deregulation. Intelligence was not calculated and this might have affected such variables as quality of life. There was no discrimination among ADHD subtypes. This study used neuropsychological measures and did not assess functional connectivity. It is possible that a study using both neuropsychological measures and assessments of functional connectivity and analysis of association between functional connectivity and neuropsychological measures might provide new valuable information. In this study neuropsychological measures as well as brain imaging methods were used to investigate the possible end phenotypes of neuropsychiatric disorders. Previous studies found impaired neurocognition in pediatric bipolar disorders [52,53]. In addition to the results of neuroimaging studies, the findings of neuropsychological tests could be used to identify abnormal brain function in certain developmental neuropsychiatric diseases such as BD which might be distinct from other diseases such as ADHD and although their symptoms might be overlapping the results of neuropsychological tests and brain imaging studies might be different. These occurrences of abnormal rCBF may be considered early signs of the presence of bipolar disorder in adolescents with ADHD. Longitudinal studies should be designed to investigate their role as possible markers to monitor response to interventions. This study was funded by grants from the Ministry of Science and Technology, R.O.C. (105-2314-B- 016 -016 -MY3) and from Tri-Service General Hospital (TSGH-C106-103). A data sharing statement: there is no additional data to share. The Institutional Review Board of the Tri- Service General Hospital approved the study protocol and the patients’ parents provided written informed consent. Doerfler LA, Connor DF, Toscano PF Jr. Aggression, ADHD symptoms, and dysphoria in children and adolescents diagnosed with bipolar disorder and ADHD. J. Affect. Disord 131(1), 312-319 (2011). Frías Á, Palma C, Farriols N. Comorbidity in pediatric bipolar disorder, prevalence, clinical impact, etiology and treatment. J. Affect. Disord 174(1), 378-389 (2015). Masi G, Perugi G, Toni C, et al. Attention-deficit hyperactivity disorder -- bipolar comorbidity in children and adolescents. Bipolar. Disord 8(1), 373-381(2006). Donfrancesco R, Miano S, Martines F, et al. Bipolar disorder co-morbidity in children with attention deficit hyperactivity disorder. Psychiatry. Res 186, 333-337 (2011). Barkley RA. Attention-deficit hyperactivity disorder, a handbook for diagnosis and treatment (1997). Wang LJ, Chan WC, Chou MC, et al. Polymorphisms of STS gene and SULT2A1 gene and neurosteroid levels in Han Chinese boys with attention-deficit/hyperactivity disorder, an exploratory investigation. Sci. Rep 23(1), 45595 (2017). Galanter CA, Leibenluft E. Frontiers between attention deficit hyperactivity disorder and bipolar disorder. Child Adolesc. Psychiatr. Clin. N. Am 17(1), 325-346 (2008). Erskine HE, Norman RE, Ferrari AJ, et al. Long-Term Outcomes of Attention-Deficit/Hyperactivity Disorder and Conduct Disorder, A Systematic Review and Meta-Analysis. J. Am. Acad. Child Adolesc. Psychiatry 55(1), 841-850 (2016). Findling RL. Diagnosis and treatment of bipolar disorder in young patients. J. Clin. Psychiatry 70(1), e45 (2009). Lopez-Larson M, Michael ES, Terry JE, et al. Subcortical differences among youths with attention-deficit/hyperactivity disorder compared to those with bipolar disorder with and without attention-deficit/hyperactivity disorder. J. Child. Adolesc. Psychopharmacol 19(1), 31-39 (2009). Lorberboym M, Watemberg N, Nissenkorn A, et al. Technetium 99m ethylcysteinate dimer single-photon emission computed tomography (SPECT) during intellectual stress test in children and adolescents with pure versus comorbid attention-deficit hyperactivity disorder (ADHD). J. Child Neurol 19(1), 91-96 (2004). Yeh CB, Huang WS, Lo MC, et al. The rCBF brain mapping in adolescent ADHD comorbid developmental coordination disorder and its changes after MPH challenging. Eur. J. Paediatr. Neurol 16(1), 613-618 (2012). Kaya GC, Pekcanlar A, Bekis R, et al. Technetium-99m HMPAO brain SPECT in children with attention deficit hyperactivity disorder. Ann. Nucl. Med 16(1), 527-531 (2002). Adler CM, Delbello MP, Mills NP, et al. Comorbid ADHD is associated with altered patterns of neuronal activation in adolescents with bipolar disorder performing a simple attention task. Bipolar. Disord 7(1), 577-588 (2005). Gau SS, Chong MY, Chen TH, et al. A 3-year panel study of mental disorders among adolescents in Taiwan. Am. J. Psychiatry 162(1), 1344-1350 (2005). Yeh CB, Gau SS, Kessler RC, et al. Psychometric properties of the Chinese version of the adult ADHD Self-report Scale. Int. J. Methods. Psychiatr. Res 17(1), 45-54 (2008). Sonnby K, Skordas K, Olofsdotter S, et al. Validation of the World Health Organization Adult ADHD Self-Report Scale for adolescents. Nord. J. Psychiatry 69(1), 216-223 (2015). Leibenluft E. Severe mood dysregulation, irritability, and the diagnostic boundaries of bipolar disorder in youths. Am. J. Psychiatry 168(1), 129-142 (2011). Li CH, KO HC, Weng LJ, et al. The development of an impulsiveness scale, psychometric properties and relation to antisocial personality disorder. Chinese. J. Psychol 44(1), 109-119 (2002). Chung KF, Tso KC, Chung RT. Validation of the Mood Disorder Questionnaire in the general population in Hong Kong. Compr. Psychiatry 50(1), 471-476 (2009). Chao CY, Gau SS, Mao WC, et al. Relationship of attention-deficit-hyperactivity disorder symptoms, depressive/anxiety symptoms, and life quality in young men. Psychiatry. Clin. Neurosci 62(1), 421-426 (2008). Tang TC, Jou SH, Ko CH, et al. Randomized study of school-based intensive interpersonal psychotherapy for depressed adolescents with suicidal risk and parasuicide behaviors. Psychiatry. Clin. Neurosci 63(1), 463-670 (2009). Yao G, Chung CW, Yu CF, et al. Development and verification of validity and reliability of the WHOQOL-BREF Taiwan version. J. Formos. Med. Assoc 101(1), 342-351 (2002). Gau SS, Shen HY, Chou MC, et al. Determinants of adherence to methylphenidate and the impact of poor adherence on maternal and family measures. J. Child. Adolesc. Psychopharmacol 16(1), 286-297 (2006). LT C. A method for attenuation correction in radionuclide computed tomography. IEEE Trans. Nucl. Sci 25(1), 638-643 (1978). Worsley KJ, FK. A test for a conjunction. Stat. Probabil. Lett 47(1),135-140 (2000). Morbelli S, Rodriguez G, Mignone A, et al. The need of appropriate brain SPECT templates for SPM comparisons. Q. J. Nucl. Med. Mol. Imaging 52(1), 89-98 (2008). Bosanac P, Mancuso SG, Castle DJ. Anxiety Symptoms in Psychotic Disorders, Results from the Second Australian National Mental Health Survey. Clin. Schizophr. Relat. Psychoses 10(1), 93-100 (2016). Hernandez M, Marangoni C, Grant MC, et al. Parental Reports of Prodromal Psychopathology in Pediatric Bipolar Disorder. Curr. Neuropharmacol (2016). Pan PY, Yeh CB. Impact of depressive/anxiety symptoms on the quality of life of adolescents with ADHD, a community-based 1-year prospective follow-up study. Eur. Child. Adolesc. Psychiatry 26(1), 659-667 (2017). Luckenbaugh DA, Findling RL, Leverich GS, et al. Earliest symptoms discriminating juvenile-onset bipolar illness from ADHD. Bipolar. Disord 11(1), 441-451 (2009). Shaw P, Lerch J, Greenstein D, et al. Longitudinal mapping of cortical thickness and clinical outcome in children and adolescents with attention-deficit/hyperactivity disorder. Arch. Gen. Psychiatry 63(1), 540-549 (2006). Dickstein DP, Milham MP, Nugent AC, et al. Frontotemporal alterations in pediatric bipolar disorder, results of a voxel-based morphometry study. Arch. Gen. Psychiatry 62(1), 734-741 (2005). Adleman NE, Fromm SJ, Razdan V, et al. Cross-sectional and longitudinal abnormalities in brain structure in children with severe mood dysregulation or bipolar disorder. J. Child. Psychol. Psychiatry 53(1), 1149-1156 (2012). Rich BA, Vinton DT, Roberson-Nay R, et al. Limbic hyperactivation during processing of neutral facial expressions in children with bipolar disorder. Proc. Natl. Acad. Sci. U. S. A 103(1), 8900-8905 (2006). Boes AD, Grafft AH, Joshi C, et al. Behavioral effects of congenital ventromedial prefrontal cortex malformation. BMC. Neurol 11(1),151 (2011). Leibenluft E, Rich BA, Vinton DT, et al. Neural circuitry engaged during unsuccessful motor inhibition in pediatric bipolar disorder. Am. J. Psychiatry 164(1), 52-60 (2007). Versace A, Thompson WK, Zhou D, et al. Abnormal left and right amygdala-orbitofrontal cortical functional connectivity to emotional faces, state versus trait vulnerability markers of depression in bipolar disorder. Biol. Psychiatry 67(1), 422-431 (2010). Versace A, Almeida JR, Hassel S, et al. Elevated left and reduced right orbitomedial prefrontal fractional anisotropy in adults with bipolar disorder revealed by tract-based spatial statistics. Arch. Gen. Psychiatry 65(1), 1041-1052 (2008). Cassano GB, Rucci P, Benvenuti A, et al. The role of psychomotor activation in discriminating unipolar from bipolar disorders, a classification-tree analysis. J. Clin. Psychiatry 73(1), 22-28 (2012). Brotman MA, Schmajuk M, Rich BA, et al. Prevalence, clinical correlates, and longitudinal course of severe mood dysregulation in children. Biol. Psychiatry 60(1), 991-997 (2006). MacMaster FP, Leslie R, Rosenberg DR, et al. Pituitary gland volume in adolescent and young adult bipolar and unipolar depression. Bipolar. Disord 10(1), 101-104 (2008). Chen HH, Nicoletti M, Sanches M, et al. Normal pituitary volumes in children and adolescents with bipolar disorder, a magnetic resonance imaging study. Depress. Anxiety 20(1), 182-186, (2004). Hajek T, Gunde E, Bernier D, et al. Pituitary volumes in relatives of bipolar patients, high-risk study. Eur. Arch. Psychiatry. Clin. Neurosci 258(1), 357-362 (2008). Sharp DJ, Bonnelle V, De Boissezon X, et al. Distinct frontal systems for response inhibition, attentional capture, and error processing. Proc. Natl. Acad. Sci. U.S.A 107(1), 6106-6111 (2010). Weathers JD, Stringaris A, Deveney CM, et al. A developmental study of the neural circuitry mediating motor inhibition in bipolar disorder. Am. J. Psychiatry 169(1), 633-641 (2012). Konishi S, Jimura K, Asari T, et al. Transient activation of superior prefrontal cortex during inhibition of cognitive set. J. Neurosci 23(1), 7776-7782 (2003). Mills NP, Delbello MP, Adler CM, et al. MRI analysis of cerebellar vermal abnormalities in bipolar disorder. Am. J. Psychiatry 162(1), 1530-1532 (2005). Kim D, Cho HB, Dager SR, et al. Posterior cerebellar vermal deficits in bipolar disorder. J. Affect. Disord 150(1), 499-506 (2013). Portugal LC, Rosa MJ, Rao A, et al. Can Emotional and Behavioral Dysregulation in Youth Be Decoded from Functional Neuroimaging? PLoS. One 11(1), e0117603 (2016). Minichino A, Bersani FS, Spagnoli F, et al. Prefronto-cerebellar transcranial direct current stimulation improves sleep quality in euthymic bipolar patients, a brief report. Behav. Neurol 2014(1), 876521 (2014). Forlenza OV, Coutinho AM, Aprahamian I, et al. Long-term lithium treatment reduces glucose metabolism in the cerebellum and hippocampus of nondemented older adults, an [(1)(8)F]FDG-PET study. ACS. Chem. Neurosci 5(1), 484-489 (2014). Elias LR, Miskowiak KW, Vale AM, et al. Cognitive impairment in euthymic pediatric bipolar disorder, a systematic review and meta-Analysis. J. Am. Acad. Child. Adolesc. Psychiatry 56(1), 286-296 (2017).